Have anyone in your life who puts their needs in front of yours? Who will never, ever, EVER say they’re wrong – or “sorry” no matter how wrong they were? A master manipulator? Someone who makes you feel crazy or selfish for having your own needs and feelings? You are not alone. Narcissism is a very real thing and it can truly mess with you. We turned to author, Certified Life Coach, and FB group leader Tina Fuller, who is a survivor and has healed from having a Narcissistic Mother (NM) to answer some questions. There are several different types or labels for narcissism. In my experience using too many labels causes confusion, especially when the labels are constantly being changed. As with all individuals, there is no 1 set standard or “ one size fits all” when dealing with narcissists. If a narcissist has more than 1 disorder or is also suffering from a mental illness, it just makes things even more complicated. There are also different ranges of narcissism. (similar to a stove; low, medium or high.) 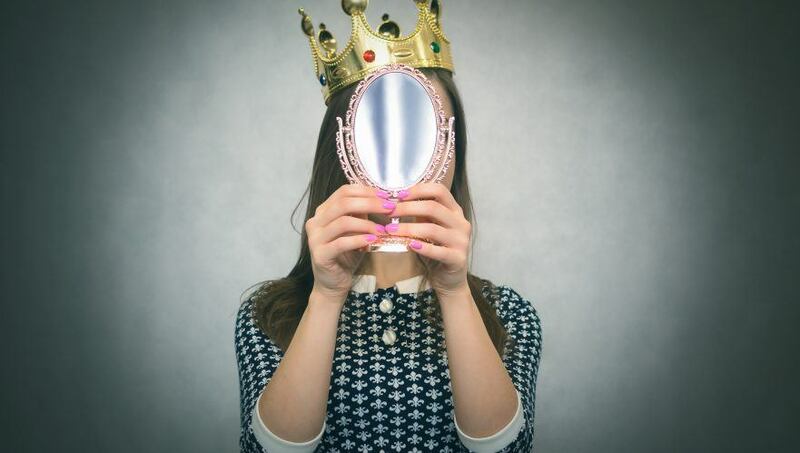 In keeping it simple, narcissists can be overt, covert, or a combination of both. Overt narcissists are much easier to spot. A covert narcissist is much more difficult to identify. An overt narcissist will initially present themselves as a very charming, caring and charismatic person until they feel comfortable enough to show their true colors. A covert narcissist will initially present themselves as a shy, kind and giving person. They are masters at making people feel sorry for them. Unlike the overt, they lack the confidence to show off their feelings of being ‘special.’ Like the overt, a covert will show their true colors and begin the abuse once the person is fully invested in the relationship. 2. Is narcissism hereditary? Am I doomed to inherit those traits? Or am I prone to marry one? There are many studies and theories concerning any genetic component of narcissism. As of yet, there is no factual proof that it is hereditary. Narcissism can develop from childhood trauma (real or perceived) or overindulgence of a child which causes entitlement. Having a narcissistic parent is traumatic and can raise the chance of a child developing narcissism due to the trauma. This of course gives the appearance of having a hereditary factor. Of course not all children who experience trauma will develop NPD. As in any family, children pick up traits from their parents. The way a person talks, stands, mannerisms, etc. It is merely a factor of the environment a person grows up in. Therefore, of course children of narcissists will pick up behaviors and traits from their narcissistic parent. The good news is that a person who is not narcissistic can change. 3. What are ways to heal from growing up with narcissistic personality disorder? Acceptance of the fact that your parent has a personality disorder, and that you will never have a loving relationship with them. Narcissists are incapable of feeling love. Many people go through a mourning period for the parent they wish they had. Since a narcissist is capable of completely destroying a person’s self-esteem/worth, it must be rebuilt. A narcissist sees their children as an extension of themselves. Understand that you are not who your parent says you are. They have a distorted version of you. Therefore, it is very important to gain independence from a narcissist. It is perfectly normal to feel any anger towards your parent. It is important that you eventually let the anger go,otherwise the narcissist will still be in control. I describe steps for healing in detail with my 4-Step program P.A.C.E. in my book It’s My Turn. 4. Will a narcissistic grandparent’s behavior affect their grandchildren? How is this best to handle? Narcissistic grandparents will try to instill the same damage (programming) into their grandchildren. Narcissists are constantly looking for new suppliers. Since children are impressionable, defenseless and don’t have boundaries, they make perfect suppliers. It is important to protect children from narcissistic abuse. 5. What are the three most important things to know in dealing with a narcissist? A person with NPD is incapable of changing. The narcissism is so embedded in their personality that they cannot even see they have the disorder. It is very important not to engage in arguments with a narcissist. You will not win. They do not take responsibility for their actions, and will place all blame on someone or something else. In their minds, they are never wrong. You cannot make them see the error of their ways no matter how intelligent they are. Narcissists have no empathy for others. They must come first. They will lie, manipulate, and destroy anyone emotionally in order to have their needs met. Tina Fuller is a Certified Professional Coach and received her certification through iPEC (ICF accredited). The Mother Company aims to support parents and their children, providing thought-provoking web content and products based in social and emotional learning for children ages 3-6. Check out our Emmy winning children’s series, “Ruby’s Studio” along with our beautiful children’s books, music, and more. We want to be a truly helpful parenting tool… For you!